While walking the streets of New York, nearly every person I see is staring down at a screen, fully engaged with digital devices. 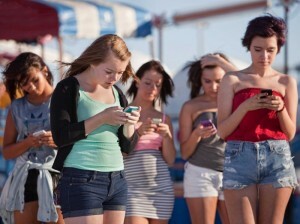 Through technology, our world has become incredibly connected; yet disconnected at the same time. There is comfort in being able to communicate without regard to time or distance but, somehow all this personal contact seems so impersonal, so two dimensional, so unnatural. 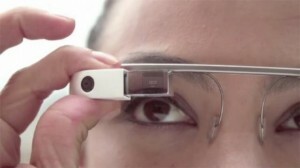 Are we all truly eager to replace all human interaction with virtual realities? 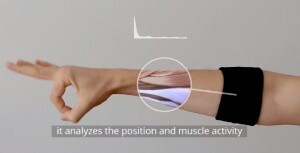 Last week, the internet was buzzing with news of a new device called Google Gesture, a wristband which could reportedly translate sign language into spoken language in real time. The viral clip turned out to be just a concept video released by a group of marketing students in Sweden, but it stirred up some interesting discussions about the role of technology in cross-cultural communication. Although most deaf/HoH are content with their lives the way they are, it’s nice to imagine a world where everyone is able to communicate seamlessly, and deaf people are not excluded from certain spaces. Over the past 30 years, technology has been viewed as a solution to provide deaf individuals greater opportunity. The most well known device, the cochlear implant, is an electronic device which allows the deaf wearer to “hear” by amplifying sounds and stimulating the auditory nerve. 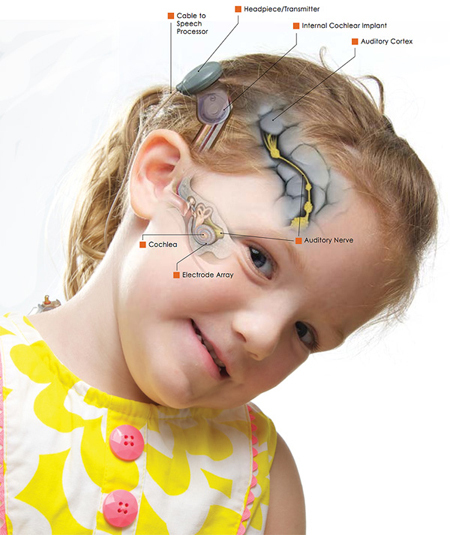 Cochlear implants require invasive surgery, are very costly, and do not allow the wearer to hear exactly the same way a hearing person does — sounds are often muddied, robotic, and can be difficult for the brain to process. Cochlear implants are not perfect, and they create a cultural grey area for wearers, who sometimes feel like they are neither Deaf nor hearing. Still, over the past few decades these devices have provided thousands of wearers with the ability to hear sounds they would otherwise not have been able to hear, and live the kind of lives they so choose to live. Having options is a positive thing. Text messaging was one of the greatest communication revolutions for the Deaf community. Before the widespread use of cell phones, deaf calls had to be made using either a Text Telephone (TTY) or a Telecommunications Relay Service (TRS). TTY allows deaf individuals to type messages, which are then sent over a telephone line to the other party as text. 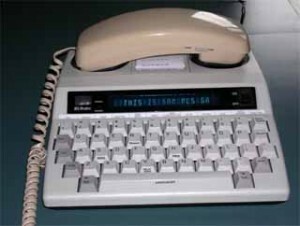 TTY requires both the sender of the message and the receiver to have a TTY device, while TRS involves the hearing party communicating through an operator, who then types responses for the deaf person to read on their TTY. Relay operators were often unfamiliar with Deaf culture, therefore unable to mediate terminology that did not translate directly. Although definitely a useful invention, TTY/TRS can be inaccurate, cumbersome, and was never a very simple solution. 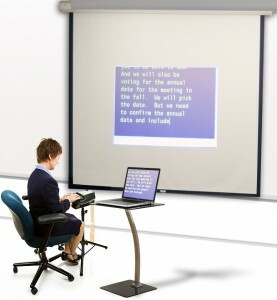 Speech-to-text services, such as Communication Access Realtime Translation (CART), have emerged in the past decade as a “real-time captioning” solution. Using this method, spoken words are transcribed into text, either by a live person or by a computer program. For one-on-one situations where there are no other options available, speech-to-text options are certainly better than nothing. This is an excellent option for hard of hearing individuals or people for whom ASL is not their native language. But the truth is that the technology is unable provide accurate translation and contextual interpretation, meaning messages can easily be misunderstood. Any periphery noise, secondary speakers, or unusual inflections can easily lead to confusion. In addition, speech-to-text does not provide a way for deaf sign language users to respond, therefore only facilitates one way communication. 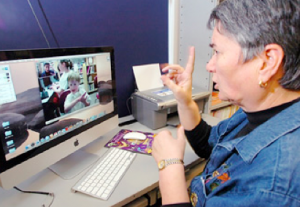 The Deaf community were among the first adopters of video chat technologies. Services such as Skype, Google Hangout, and FaceTime have made deaf-to-deaf phone calls infinitely simpler. I can’t even tell you how lovely it is to be able to video chat with my family members using ASL! For conversations between deaf and hearing people, Video Relay Interpreting offers a simple and cost-effective solution. Remote video interpreters are actually certified ASL interpreters who have knowledge of deaf culture, interpreting ethics, and how to mediate any cross-cultural misunderstandings. VRI is certainly convenient, and this technology offers deaf people more opportunity to engage with hearing entities. At the end of the day, however, VRI is designed for brief one-on-one dialogues, since remote interpreters are unable to see or hear every person in the room when they are speaking. As new devices improve all areas of our lives, making communication and information more accessible than ever, will we see a shift away from using live interpreters? In my opinion, interpreting a person’s words is a very delicate and human process. As revolutionary as emerging technologies might be, high quality ASL interpreters simply can not be replaced by a machine. Facial expressions, body language, tone, and context are all very important aspects of dialogue. In fact, research suggests that anywhere between 60% and 90% of interpersonal communication is nonverbal, which means words alone rarely covey the full message. This is specifically true of signed languages. American Sign Language is not a direct translation of English, it is a language all it’s own, with unique grammar, prose, and syntax. Deaf culture has it’s own humor, slang, and turns of phrase. ASL interpreters serve as both language and cultural interpreters. We bridge the social gaps, working to ensure deaf consumers have full access to any spoken English situations they choose. In a noisy environment, or when speakers are using ambiguous terminology, a live interpreter can mediate and provide understanding for all parties. Technology has improved deaf access in so many ways, but software and screens can never fully replicate the feel of a conversation. They can not comprehend irony, translate sarcasm, or convey emotion the way a live interpreter can. New devices will continue to make the lives of deaf Americans easier, and for this we should all be grateful! 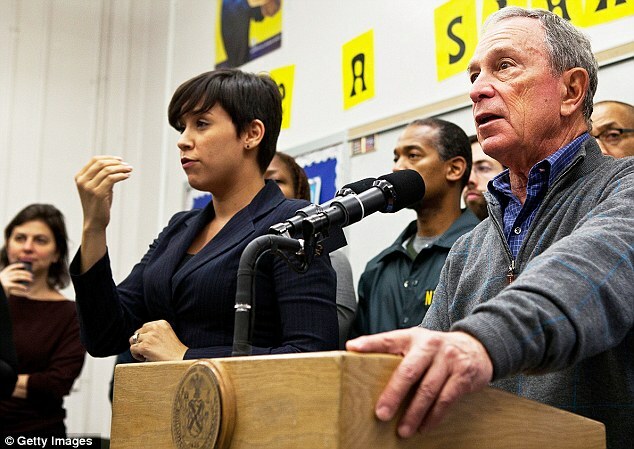 When it comes to really communicating between the deaf and hearing worlds, however, no device can replace the human element of a professional ASL interpreter.